Those less intimate with Hungarian political culture should be aware of the significance of March 15th and October 23rd, national memorial days for the 1848 and 1956 revolutions against Hapsburg and Soviet powers. 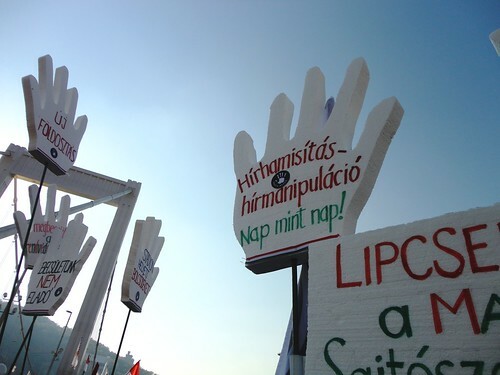 These national holidays have been used increasingly to stage political speeches, demonstrations and protests in recent years, paralleling the rising discourse around Hungary’s ‘illiberal’ turn, as reported on by international news and human rights watchdogs. As political forces in Hungary have polarised, so have the streets of Budapest, divided into an array of camps for and against the government. Since the parliamentary majority victory of the right wing party, Fidesz, and the significant electoral gains of the radical right party Jobbik, there has been increasing talk of Hungary’s movement away from liberal democratic values and the country’s increasing Euroscepticism. The lack of cohesion of liberal-left political forces for the past six years has turned political polarisation into political hegemony of the right.